Yams and sweet potatoes are botanically distinct, although the terms are often used interchangeably. 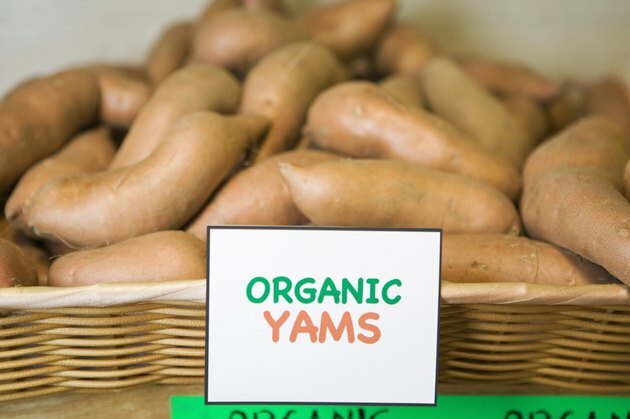 Yams have pale flesh and grow in Asia and Africa, while sweet potatoes have bright orange or yellow flesh and grow in tropical regions of the Americas, explains the University of California Cooperative Extension. An 8-ounce serving of yams provides 150 calories compared to 200 calories for sweet potatoes, and both are nutrient-dense foods. However, sweet potatoes hold an edge over yams in certain nutrients. Sweet potatoes offer 5 grams of protein in an 8-ounce serving, compared to 2 grams for yams. Neither vegetable is a particularly rich source of protein, a nutrient necessary for muscle building and tissue repair. As with most plant sources of protein, the proteins in yams and sweet potatoes do not provide all the essential amino acids your body needs. Both yams and sweet potatoes offer plentiful carbohydrates--40 grams for yams and 45 grams for sweet potatoes per 8-ounce serving. Fiber is abundant in both vegetables as well, with yams supplying 5 grams and sweet potatoes 7.5 grams. Carbohydrates provide your body with sugars, its preferred fuel source, making both yams and sweet potatoes good sources of energy. Fiber, although not digestible, improves your gastrointestinal health and may help you avoid certain cancers as well as obesity, states the University of Illinois McKinley Health Center. Both yams and sweet potatoes are very low-fat foods, with less than half a gram of fat per serving. Your body requires some dietary fat to ensure a healthy intake of fat-soluble vitamins and to keep your cell membranes in good working order, but excess fat in your diet may lead to obesity and cardiovascular problems. The low-fat content of yams and sweet potatoes may help you keep your total fat intake in check. The biggest nutritional difference between yams and sweet potatoes is their vitamin A content. An 8-ounce sweet potato supplies a whopping 270 percent of your daily requirement for this vitamin, which is needed to keep your skin and soft tissues healthy, while the same portion of yams offers only 1 percent. Both vegetables are good sources of vitamin C, vitamin B6, thiamine and pantothenic acid, with 1 cup of sweet potatoes providing between 20 and 50 percent of your daily needs for each of these vitamins, roughly double the amounts that yams contain. Vitamin C helps your body repair wounds and damaged tissues, and vitamin B6, thiamine and pantothenic acid work to metabolize your food and keep your cells in good condition. A 1-cup serving of sweet potatoes gives you half your daily requirements for potassium, copper and manganese. The same amount of yams is also a good source of these minerals, providing 20 percent of your daily needs. Potassium helps with energy production and muscle contraction, while copper plays a role in the synthesis of collagen, hemoglobin and melanin. Manganese's role in your body is indeterminate, says the Texas Heart Institute, but it is also required for ideal health. Which Is Better for You: Regular Baked Potato or Baked Sweet Potato?